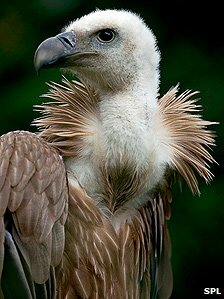 Griffon Vultures can soar at up to 11,000 metres (36,100 ft) above sea level. A perfect vantage point? Saudi Arabian officials have "detained" a vulture on accusations of being a spy for Israel, media reports say. The griffon vulture was carrying a GPS transmitter bearing the name of Tel Aviv University, prompting rumours it was part of a Zionist plot. Israeli wildlife officials dismissed the claims as ludicrous and expressed concern about the bird's fate. Last month, Egyptian officials implied the Israeli spy agency Mossad was to blame for shark attacks off its coast. The vulture, which can have a wing span of up to 265cm (8ft 8in), was caught after it landed in the desert city of Hyaal a few days ago. When locals discovered the GPS transmitter, they suspected the worst and handed it over to the security forces, said Israel's Ma'ariv newspaper. Conspiracy theories quickly began circulating in Saudi newspapers and on websites that the bird was involved in espionage. Israeli officials told Ma'ariv they were "stunned" by the allegations and concerned that the bird could meet a horrible punishment in the notoriously severe Saudi justice system. "The device does nothing more than receive and store basic data about the bird's whereabouts, and about his altitude and speed," a bird specialist at Israel's Park and Nature Authority told the newspaper. The data would be used to improve understanding of the endangered species' behaviour. "Now, this poor bird is paying a terrible price. That's very sad," said the unnamed expert. "I hope they release the poor thing." The vulture is the latest animal to be accused of being an unwitting Mossad operative. In December, the governor of Egypt's South Sinai province, Mohamed Abdul Fadil Shousha, suggested the spy agency may have had a hand in a string of deadly shark attacks off the coast of the Sharm el-Sheikh resort. He said it was "not out of the question" that Mossad had put the killer shark in the area.